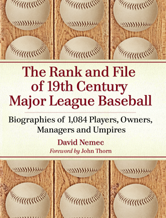 With this volume, David Nemec completes his remarkable trilogy of 19th-century baseball biographies, covering every major league player, manager, umpire, owner and league official. It provides in-depth information on many figures unknown to most historians. Each detailed entry includes vital statistics, peer-driven analysis of baseball-related skills, and an overview of the individuals role in the game. Also chronicled are players first and last major league games, most important achievements, movements from team to team, and much more. By bringing attention to these overlooked baseball personalities, this reference work immeasurably enriches our knowledge of 19th century major league baseball.